I've had questions about my antennas, how they are set up and what I do to reduce noise and RFI pickup as much as possible. Hopefully this will be interesting, and perhaps useful to others. Questions, comments, and any suggestions or notes about things you've done to improve reception and reduce RFI are certainly welcome! 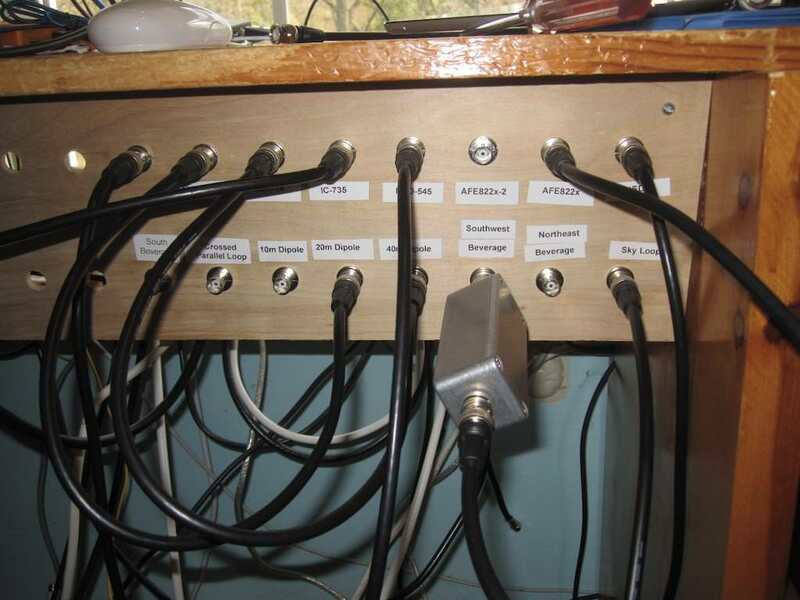 All of these antennas are fed via coax cables, with the exception of the Crossed Parallel Loop, which is fed by shielded CAT5 ethernet cable, which also provides the power and control signals. One pair of the CAT5 is the return signal. The advantage of the Squid is that it has multiple taps, allowing the best impedance match to be selected. What can I say, it's a great antenna. Excellent from the middle of the MW band up through about the middle of HF, say 19 meters. It does work on the lower end of MW, but is not as sensitive due to being too short there. And it's deaf on LW, again due to being only a fraction of a wavelength long. It does pick up signals on the upper end of HF, but it's really way too long there. But it's super sensitive on 43 meters, right where I use it the most. Picks up super weak pirates from South America. It has been patched over the years, I've had trees fall on it and pin the wire to the ground. And couldn't tell from the performance, only when I looked out my window did I know it happened. There is nothing magical about the length, it's just wha I was able to easily fit. Roughly it works down to where it is about one half to one third of a wavelength. So keep that in mind if you're building one. On the high frequency side, there is no hard limit, the performance just starts to drop off as it becomes many wavelengths long. I suspect it has a rather weird pattern especially on the higher bands, with lots of peaks and nulls. The antenna is roughly 4 sided, although there are some bends in it, 670 feet in total perimeter. The hight varies depending on the trees used, generally 20 to 50 ft high. It is fed with a 4:1 balun to RG6 coax, which is what I use exclusively. Life is too short for dealing with soldering PL-259 connectors. I recently switched to using compression F connectors instead of crimp, which has been a life changing event. So much better. Next I have the 40, 20, and 10 meter dipoles. 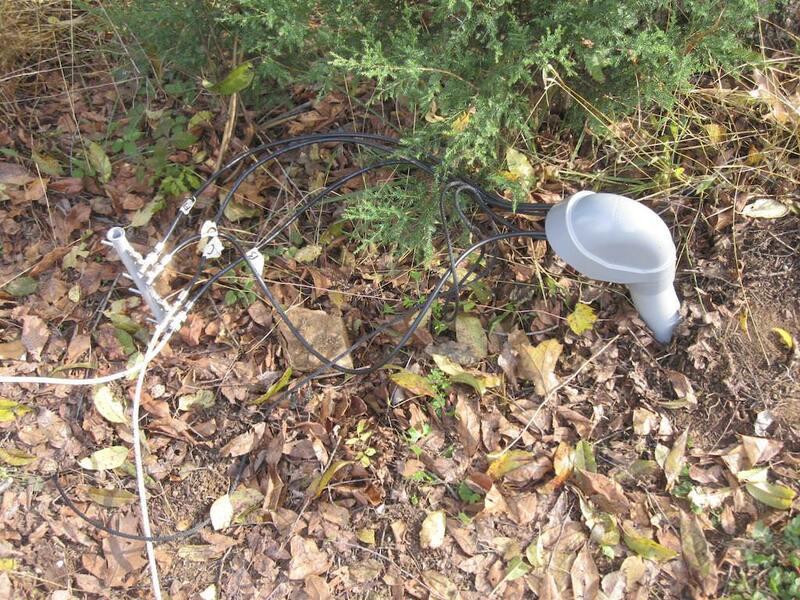 The 40 meter is a folded dipole, built with 300 ohm ladder line and fed with a 4:1 balun. The others are traditional dipoles built with regular wire and 1:1 baluns. The 40 meter dipole is sloped, the low end is maybe 6 ft high. The others are mostly horizontal, as high as I could get them. Maybe 40 or 50 feet? The beverages run about 6 to 8 feet above the ground. As mentioned above, each is fed with a Squid Universal Matching Transformer. The antenna is connected to one of the transformer taps, and a local ground rod to the other. Then the output is fed with the RG-6 coax. So the input and output of the transformer is isolated. Each beverage is terminated into about 300 ohms. I am considering removing the termination from the NE beverage as it seems to have affected DGPS reception. But the South beverage also terminated and works great. So I am not sure exactly what is happening. These antennas of course are very short at DGPS (300 kHz) and should not be considered real beverages on that band. Who knows what the actual antenna pattern is like. 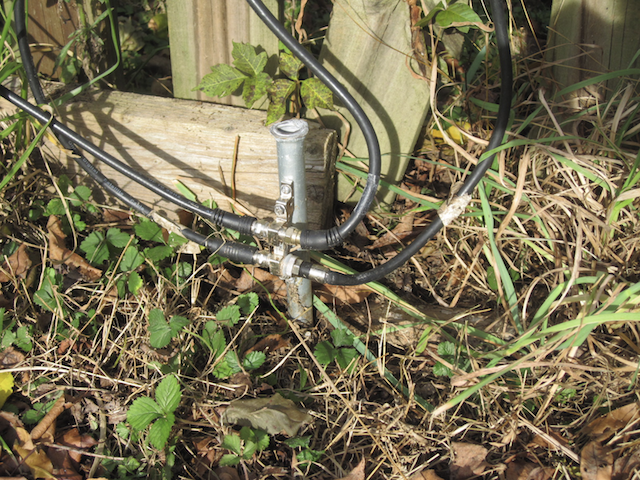 The Crossed Parallel Loop is an active antenna, built using the LZ1AQ amplifier. On LW and MW, it is directional, and I get pretty good nulls. On HF of course you can't really get a decent null and it does not seem to be very directional. It does not perform as well as any of my full sized antennas, but it is close in some cases. I actually think this would be a great antenna for anyone with limited space, and cannot put up full sized dipoles or a large sky loop. The antenna is mounting on a iron pipe that is anchored in the ground in poured concrete. There is also a rope that goes from the top of the antenna up over a tree limb, which takes some of the weight. For VHF/UHF I have a discone antenna, which is way way up in a tree. Hey, it works. Pretty well, actually. It's got a Radio Shack "satellite" pre-amp/LNA that is rated for 450-2500 MHz or so, but works OK even down on the VHF Air Band. All of my feedlines (except two of the beverages) are buried. I dug trenches and ran 2" diameter plastic conduit. This carries the coax (and CAT5 for the Crossed Parallel Loop) as well as a piece of rope, so I can pull through more cable if I need to. Running underground serves three purposes. First, yes, it looks better. 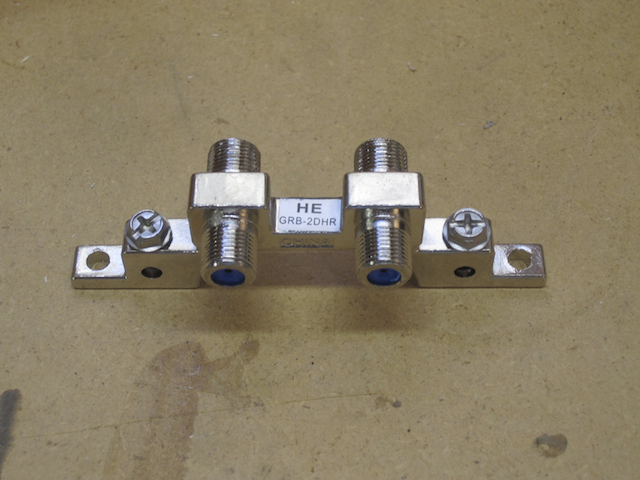 Second, the earth is lossy at HF, and can help to attenuate RFI/etc flowing on the coax shield. And third, it may be safer from a lightning safety point of view. I have three conduit runs to different locations of the yard. 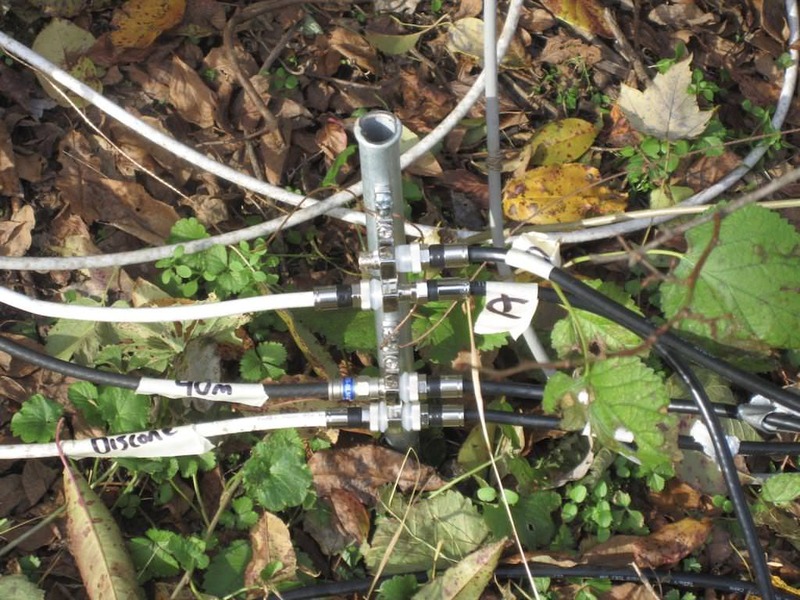 The coax for the south and west-southwest beverages is not buried, but runs just above ground level along a fence line. All of the coax cables are grounded at multiple points. At each end of the underground conduit run for the buried cables, and at the ends and several intermediate points for the two beverage runs at ground level. Why? At RF, a ground connection is only at ground potential for short wire lengths. Once the length becomes a large fraction of a wavelength, the impedance of the cable is no longer close to zero. So the opposite end of the wire is no longer at ground potential. Grounding at multiple locations helps to alleviate this. I also have a ground wire run buried alongside one of the conduit runs as a sort of ground radial, and plan on adding it to the other conduit runs. More grounds is more grounds. To ground the coax cables, I make heavy use of satellite TV grounding blocks. I got a bag of 25 of them (dual inputs) for just $16 on eBay. Each is mounted on a metal rod driven into the ground. At the shack end of the runs, there is an additional connection to my multiple ground rod system of several parallel connected rods. The coax cables from the patch board to some of radios (the netSDR and AFE822x) are wrapped around some large toroid cores, to help reduce any RFI on the shields. Whew. I think that's about it. Chris... So I thought I might just read this on the bus from the train station to the apartment which is about a 5 minute ride but happily, (and simultaneously, sadly) that was not possible - there's just way too much information here. So I will give it a good review later tonight... I just wanted to be quick and tell you nice job, and I'm sure everyone else appreciates this as much as I do. Not nearly as think as you confused I am. That is quite the impressive setup. Thanks for sharing! It certainly explains some of the great pirate catches you post about on here. Regardless, you're killing it. I presume you use the crossed parallel loop active antenna, the sky loop and the beverages for mediumwave and longwave listening? Thanks R4002. Yes, I use the crossed parallel loop often on MW where it is directional. It lets me hear that semi local pirate on 1620 by letting me null out another station. Likewise for the one that was on 1650 a few weeks ago. The discone doesn't work too well on 11m, it is only rated down to 100 MHz. An 11m vertical would probably be ideal, actually I could hoist it up a tree like I did with the discone to get maximum height I'd have to think they are relatively easy to build, vs buying one? Seems easy enough, just lay some wire on the ground and connect to one of my Squid matching transformers. I already have a free coax cable run since I just relocated the connection to the 40m dipole to the new conduit run, which shortened the length. What's one more antenna? They are indeed easy to build. The traditional 1/4 wave is probably the simplest although there are several other types being used extensively, including 5/8 wave verticals and various others. I actually have a President Texas 1800 mobile CB antenna - which is a base-loaded 7/8 wave. I've done some simple experiments with rudimentary counterpoises and the results were actually very impressive. Of course a 7/8 wave is another way of saying a 1/4 wave over a 5/8 wave (which, and I may be wrong here, is the design of the [in]famous Antron-99 or A-99 series of CB antennas). 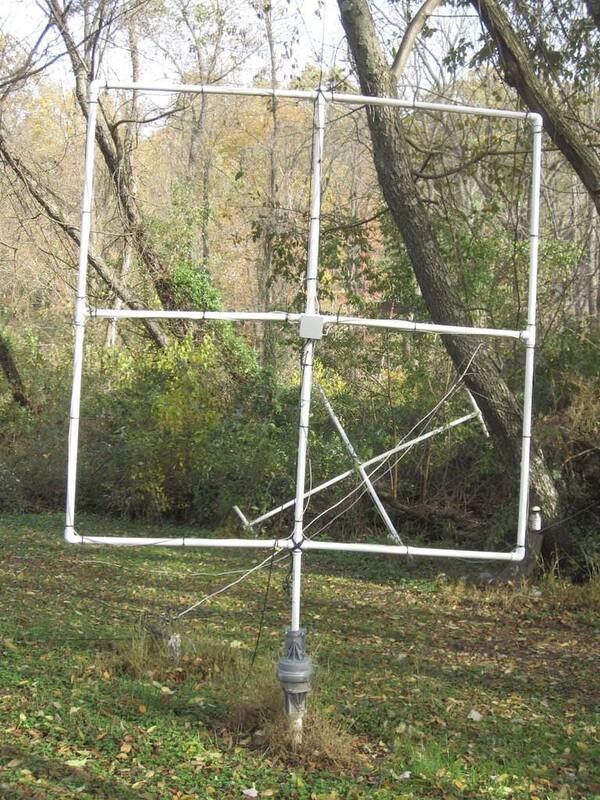 You could easily build a 1/4 wave ground plane for 26 or 27 MHz (I would go with the lower frequency) put it up on top of a tree and you'll be amazed by the results. Wow Chris, that is awesome! I used to be up your way living in Philly and Delaware. I liked the fact that the reception there seemed extra good for both S. America and Europe. I just love the setup you have and the way you utilize natural masts for installing your antennas. I really appreciate the homemade antennas you put together and the craftsmanship you utilized. How much maintenance goes into your farm? I know that what you have has taken a lot of work and perseverance probably over quite a time period. I also know what goes into burying PVC and pulling line through them but in the end it makes for a professional job. Major Kudo's Dude!! Thanks for sharing, there's a lot of good information here. I do have a question. Why do you describe your Beverage antennas as "mini"? I am not aware that there's such a thing, particularly since yours are all over 200 feet long. Thanks! But yes, for HF purposes, once they are much over a wavelength I think they qualify as a beverage. I am surprised at the directionality I even get on MW with them, where they are a fraction of a wavelength. Never be afraid to try an antenna, worst case it doesn't work well and you take it down and try again (like with my recent Loop On Ground experiments, although I still think the LoG is a good antenna if you have HOA issues). For the upper bands like 11 and 10 meters I built a double bazooka antenna pulled up vertical in a high tree fed with RG8x coax. The antenna works great. For the antenna to work correctly use a 50 ohm non double shielded coax like RG8x or 213 for the antenna part. You can feed it with double sheilded coax. Look up the design on the net. Great set up there Chris, unfortunately I don't have the space nor the time or enthusiasm to go to the lengths (no pun intended) that you have. You display a great dedication to the hobby and "I dips me lid" to you, cracking set up! Just an aside...Are they wild strawberries or feral blackberry growing at the area around your multiple grounding pole? Yaesu FT-2000D, ICOM IC-736 HF/50MHz, ICOM IC R75 & Tecsun S-2000 to 450 feet of wire, and a multi band vertical of dubious reliability. Yes, you spotted them, wild strawberries. They don't taste very good, however. We do have wild raspberries and blackberries around the edges of the yard which taste better. Also about a dozen domesticated blueberry bushes. The birds even let us eat some of them. On the beverage antennas, no matter what their length, they're aperiodic directional antennas - unless they're not terminated, the termination causes/determines the aperiodicity as well as the directionality. Their length does influence what freqs they best respond to but they're still aperiodic, meaning they should respond equally unwell (lol) to any signal. If unterminated, the antenna is just a "long" wire type that will have standing waves. Periodic antennas will have standing waves to a large degree, aperiodic ones will have greatly reduced or no standing waves. As you guessed, a dummy load is a pretty decent aperiodic antenna. Some HAMs have used bev's for v/uhf work, where their lengths add massive gain and (fixed) directionality. An example of length effecting directionality per frequency in use, a friend had a 600ft dipole, up about 70 feet at the center. It worked great on 160m and hf, but the higher you went frequencywise the more lobes and nulls appeared untill at 10m if the station wasn't directly in line with the legs of the dipole you'd never know he was on the air. A breeze (let alone rain, dust, snow) would create enough static precip it would arc over at the pl259. I had a horizontal 2wl 11m antenna up about a wl on 11m, and there were stations only a few blocks from each other where one had me at s9 plus yet his neighbor couldn't hear me at all. Looking at the lobes resulting from a given wire length reveals a lot about why long wires perform as they do. A bev antenna does away with the multiplicity of peaks and lobes of a similarly sized wire antenna and you end up with a massive lobe facing the direction of the termination. Pretty neat. If you needed a single wire antenna that worked the entire hf band decently, you'd shoot for an aperiodic like a T2FD or bev or mebbe a fishbone/herringbone (these are huge antennas when laid out for mw or hf), come to think of it, aren't active antennas aperiodic? Just came across this thread - this is great! Thanks for posting it, Chris. I'm learning a lot. I'm trying to figure out what antenna to try next. Right now I have an end fed long wire (~75ft @ 50ft high). It works pretty good, but being on the west coast makes it tough to pick up US pirate and Europe. Rural area, so I don't really have too much QRN as compared to urban areas. Might go for a loop next. Got a tennis ball cannon over the summer and was able to launch a dipole into my trees at ~100ft. Patchboard is a great idea; I didn't think of that. Good switches are expensive, but this would work great. I'll have to build one!